The funeral service of Bishop Dr. Taranath Sagar was held on October 21, 2015 at 11:00 am at Richmond Town Methodist Church, Bangalore. It was attended by large numbers of people from around the country and abroad. The service was conducted by Rev. M. A. Daniel, General Secretary, MCI. Bishop Anil Servand delivered the message in which he spoke about Bishop Sagar’s ecumenical initiatives, various accomplishments and works he inspired. He also shared his intention to continue exploring possibilities to further the talks of the Methodist Church in India joining Church of North India (CNI), Church of South India (CSI) and the Marthoma Church in the Communion of Churches in India (CCI) for greater witness and service. 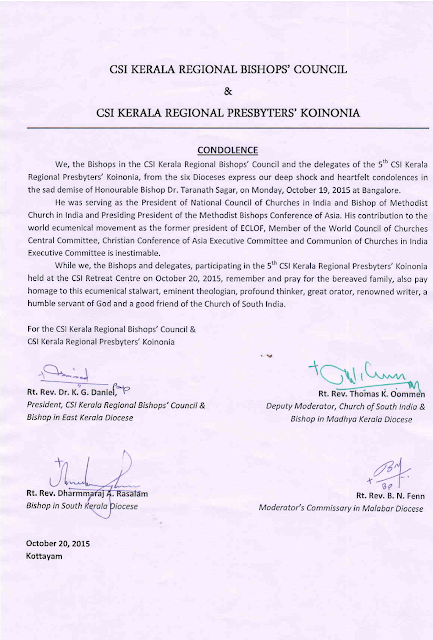 Among many esteemed leaders present, the following members gave eulogies: Bishop N. L. Karkare, President of the Council of Bishops, MCI; Bishop Subodh Mondol, Bishop, MCI Delhi Episcopal area; Bishop Philip Masih, Bishop, MCI Lucknow Episcopal area; Dr. J. N. Hanchinmani, Central Treasurer, MCI; Fr. Bernard, Archbishop of Bangalore; Rev. M. A. Daniel, General Secretary, MCI; Mr. Michael Paul, Executive Council Member, MCI; Most Rev. Dyvashirvadam, Moderator, CSI; Rt. Rev. P. C. Singh, Deputy Moderator, CNI; Dr. Mathews George Chunakara, General Secretary, Christian Conference of Asia; Rev. Christopher Rajkumar (on behalf of Rev. Dr. Roger Gaikwad, General Secretary, NCCI); Dr. Santanu Patro, Registrar, Senate of Serampore College; Rev. Dr. Vincent Rajkumar, Director, CISRS; Mr. Sanjeev Dayanand, Conference Treasurer, South India Regional Conference, MCI; Rev. B. U. Bhaktanand, Brother-in-law of Bishop Dr. Sagar; Mr. Surendranath Sagar, Brother of Bishop Dr. Sagar; and Mrs. Sharon, Daughter of Bishop Dr. Sagar. From the NCCI, Rev. Christopher Rajkumar, Rev. Caesar David, Rev. Sweety Helen and Mr. Samuel Jayakumar paid their respects on behalf of the NCCI family and placed wreaths. Dr. Saramma Varghese also placed wreaths on behalf of All India Council for Christian Women (AICCW) and the Orthodox Church. It was a solemn service marked with an air of grief. It was also a time of thanksgiving to God for the leadership and vision that the Church has been blessed with by the wonderful ministry of Bishop Dr. Sagar. The rich tributes and remembrances shared during this service gave evidence of the profundity of Bishop Dr. Sagar’s work, and there was the overwhelming sense of inspiration to continue carrying on his vision and faithful service for the Glory of God and to the blessing of people. NCCI office received several condolence messages / tributes. These are found here below. (Please note that there are also other messages received on NCCI's facebook page - www.facebook.com/nccionline). We are grateful to the individuals and organizations for writing in to express grief and sympathy. 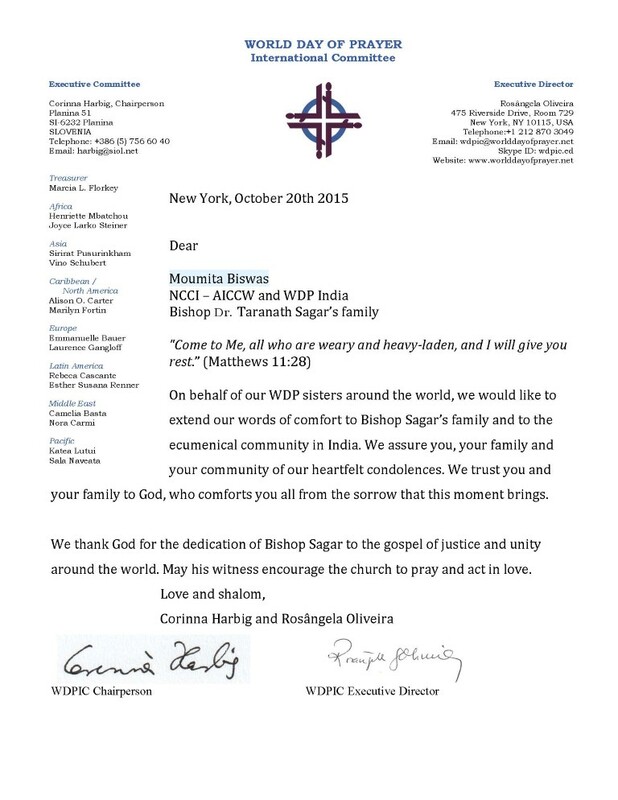 These messages will be also passed on to the family of Bishop Dr. Sagar. A few minutes back, have received information through msg that Bishop Taranath Sagar, President, NCCI has passed away into glory. We had been together in the NCCI Executive Committee during 2004-08 and then had served with him during his Presidentship during 2008-12. I vividly remember his interjection during the 2004 Tirunelvelli Quadrennial and then working together in the Presidium of 2008-12, Bishop Sagar, the President, Sushma, Michael Angeleous and self as Vice-Presidents. We were quite a team and it was difficult times we faced - with court cases against NCCI filed in the Nagpur Bench of the Bombay High Court as well, in the Nagpur District Court. During the 2010 CCA Assembly in Kuala Lumpur, were together along with Sushma Ramaswamy (my co-Vice President) as NCCI delegates. After the 2012 Bengaluru Quadrennial, we met off and on and the last time, I met him was in New Delhi at the ESHA programme during 26 & 27 August, 2015. We exchanged notes and views at the YMCA, New Delhi during dinner time. And so, it is difficult to digest that Bishop Taranath Sagar is no more with us. ones who have gone ahead of us to eternal glory. Bishop Dr. Taranath Sagar, senior Bishop of the Methodist Church in India and the President of the National Council of Churches in India (NCCI) passed away at 8.00 p.m. on Monday 19 October 2015. He died of a heart attack in a hospital in Bangalore, India. The funeral service will be held at 11.00 a.m. on Wednesday 21 October at the Richmond Town Methodist Church, Bangalore. Bishop Sagar has been actively involved in the ecumenical movement during the past three decades through various ecumenical and ecclesiastical organisations in India, Asia and at the global levels. He has been a member of the Executive Committee of the Christian Conference of Asia (CCA) since its last General Assembly held in Jakarta in May 2015. He was first elected to the Central Committee of the World Council of Churches at the Port Allegro Assembly, Brazil in 2006 and for a second term at the Bussan Assembly in 2013. 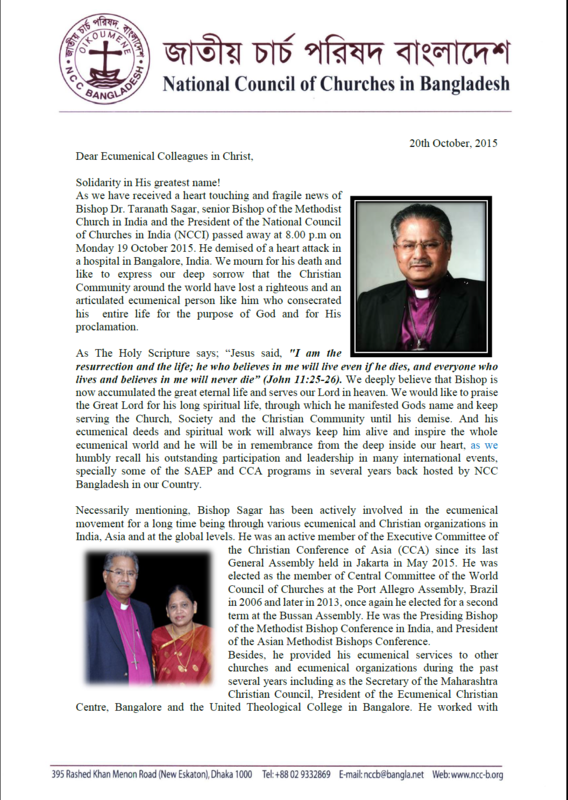 He was the Presiding Bishop of the Methodist Bishop Conference in India, and President of the Asian Methodist Bishops Conference. He served numerous other church and ecumenical organisations in various capacities during the past several years including as the Secretary of the Maharashtra Christian Council, President of the Ecumenical Christian Centre, Bangalore and the United Theological College in Bangalore. Recalling his ecumenical contributions, Dr. Mathews George Chunakara, General Secretary of the Christian Conference of Asia said that “With the passing away of Bishop Taranath Sagar, the Indian and Asian ecumenical movement lost a committed ecumenist who has been faithfully echoing the concerns and aspirations of the Asian churches in the global ecumenical movement. We thank God for the gifts God bestowed on Bishop Taranath Sagar, who guided the Church and various ecumenical organisations during the past three decades. He was a committed Christian, ecumenical Statesman, staunch defender, who was always raising his voice for justice and dignity of the marginalized and the persecuted. While tirelessly articulating his convictions, Bishop Sagar could relate to all sections of the people, and he spared no efforts to defend justice and dignity”. We are deeply shocked and saddened to hear the sudden demise of Rt.Rev.Dr. Taranath Sagar on 19th October 2015 at Bengaluru. We express our heartfelt condolence to the bereaved family members, colleagues and friends. At this time of mourning we pray to the Almighty to give moral strength, courage and support to all the members of the family, kith and kin, colleagues and friends. It is a great loss to the global ecumenical family and Bishop Sagar will be remembered for his committed and dedicated service to humanity that he carried a message of love, peace and justice to all human and nature which needs to be sustained and continued with a hope for ever. Our Prayer to God and wish his soul to rest in eternal peace in the abode of Almighty. on-behalf of IRDWSI, ODAF, FCFC and Oikotree. NCCI is on her new ventures . We pray almighty to give His heavenly consolation to the bereaved members of his family and his Church . 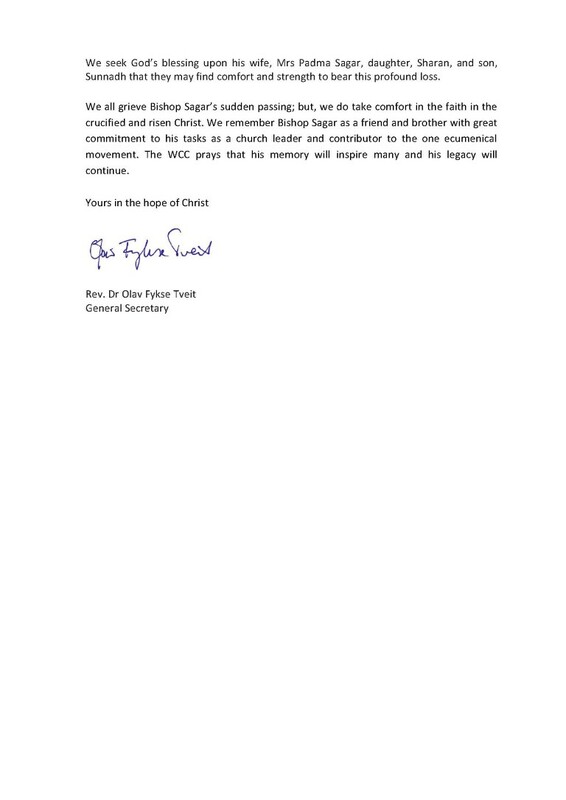 Its a sad news for all of us to hear the final call of Bishop Sagar, for eternal rest. As the President of the NCCI he has rendered commendable leadership all through the various times. Indeed he was a colleagues and a friend to one and all. 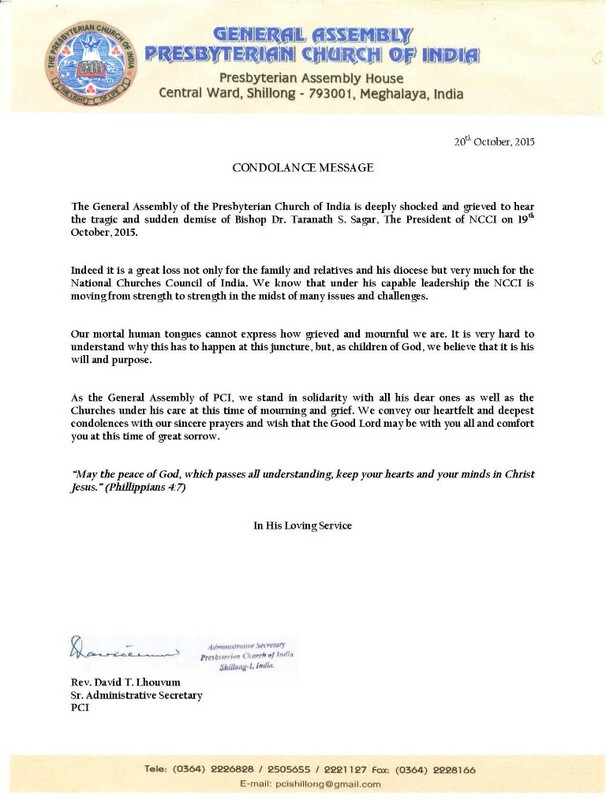 l sincerely convey the deepest sympathy to his wife and all Methodist Church members from NCCI, and all its partners at this time of bereavement. May his soul be RIP. I beg your pardon for my inability to be present in person, yet my prayer with you all. We were shocked and saddened to hear passing away of Bishop Sagar. 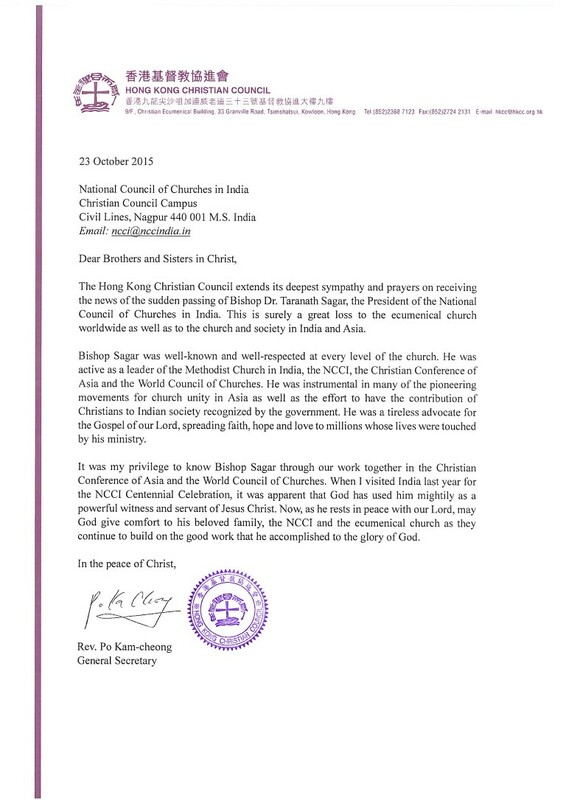 My only extended engagement with Bishop Sagar was during the visit of Indian delegation to China in November 2014 and I fondly remember the friendly and gracious ways he engaged with the Indian group as well as the Chinese colleagues we met in a few congregations, church institutions, theological seminaries, and the Chinese government officials for Religious affairs. I have referred several times to few photos we posted on this trip in the our website: www.ftesea.org when we talked about the China visit and Indian delegation members. It is our prayer that God give the needed strength to his family members, office, church, ecumenical colleagues, and to all his friends/well wishers to bear this irreplaceable loss, and to continue the ministry that Bishop has been engaged in church and society. I can not believe that Bishop Dr.Taranath Sagar has passed away. I am shocked and saddened to hear this tragic news. I had the privilege of working with him form 2008 to 2012 as Vice President of NCCI during his first Presidential tenure. His able leadership had guided NCCI through difficult times. He had profound engagement in the worldwide ecumenical movement. I remember all good moment I spend with him on and off the meetings. He was kind enough to host several NCCI's meeting at his place in Bangalore. That reflected his deep commitment for the movement. His sudden death has caused great loss to the ecumenical communities around the world, particularly to NCCI. I join the behaved family in this time of grief and pain. at the same time, I thank God for blessing the Ecumenical Movement in India through his potential leadership. 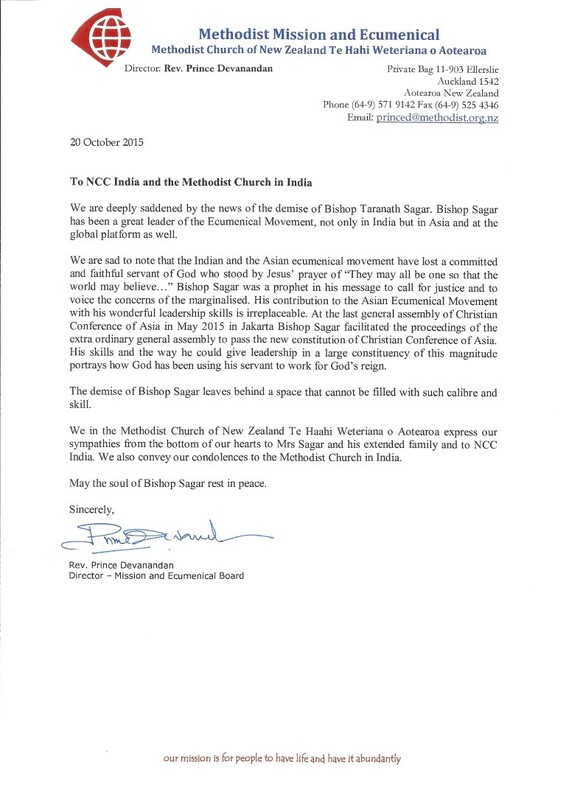 With sadness and shock, we received the news of the passing away of Bishop Dr. Taranath Sagar, Senior Bishop of Methodist Church in India and the President of the National Council of Churches in India. Bishop Sagar was one of the tall Ecumenical leaders of India who was the proponent of wider ecumenism and worked diligently for that goal during the past 3 decades through various ecumenical and ecclesiastical organizations in India, Asia and at the Global level. The encouraging move from the Methodist Church in India to initiate the discussion to be part of the Communion of Churches in India was the result of his envision. In his passing away, CSI has lost a good friend, and a valuable partner in mission. The Churches in India and in Asia lost a powerful voice which represented the marginal communities with genuine commitment. 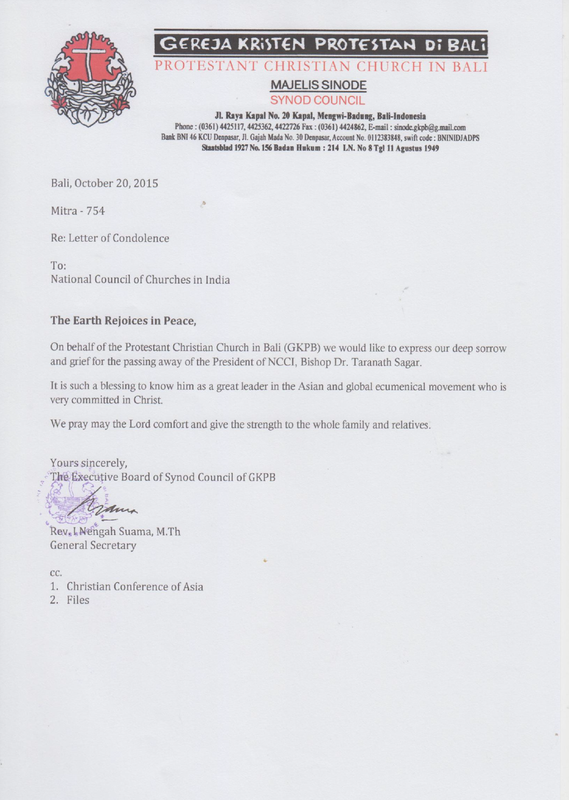 On behalf of Church of South India, the Moderator, Most Rev. Dr. G. Dyvasirvadam, the Deputy Moderator, Rt. Rev. Thomas K. Oommen, the Treasurer, Adv. Robert Bruce and the General Secretary, Rev. Dr. D. R. Sadananda, express deep condolences on the demise of Bishop Sagar and pray that the presence of the comforting spirit of the Lord be upon his wife Mrs. Padma Sagar and his son and daughter and their families. I am distressed at the news of the passing away of former Chairperson and the present ECC Council Memeber Rt. Rev. Dr. Taranath Sagar on October 19, 2015. As I understand he was a godly man with sterling virtues and will be deeply mourned by the NCCI Committee. May I tender our deepest condolences from my personal behalf and on behalf of the National Council of YMCAs of India. Our prayers for the peaceful repose of the soul in heaven and for strength to the bereaved family in this hour of tragedy. 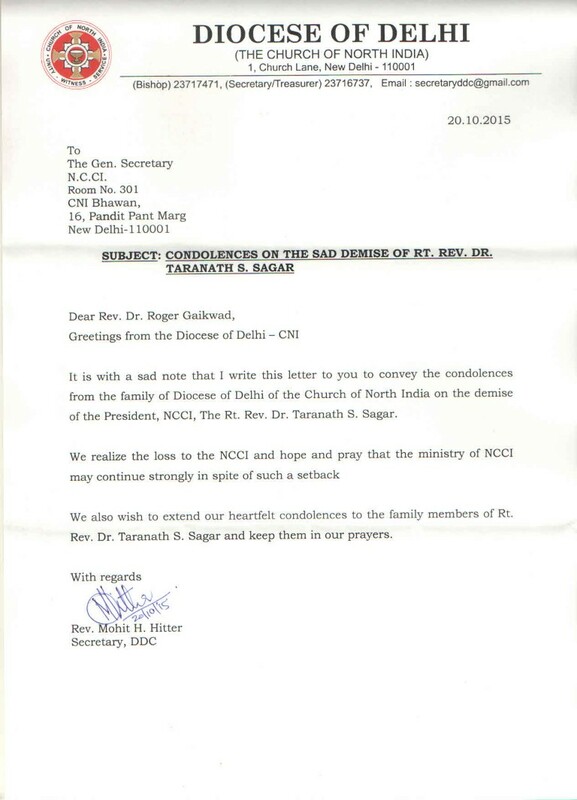 We convey our deepest condolences from Normisjon as the NCCI lost its very dynamic President Bishop Taranath Sagar. I and my wife had a very close working partnership with the Methodist Church in Andaman Islands under the leadership of Bishop Taranath Sagar and we maintained a long-standing friendship with him beyond our denominational boundaries. His active involvement in the mission initiatives of the Church is very much remembered at this point of time. We pray that the NCCI and the Methodist Church will find peace and comfort at this moment of loss of a great mentor. Be assured of our continuous prayers. 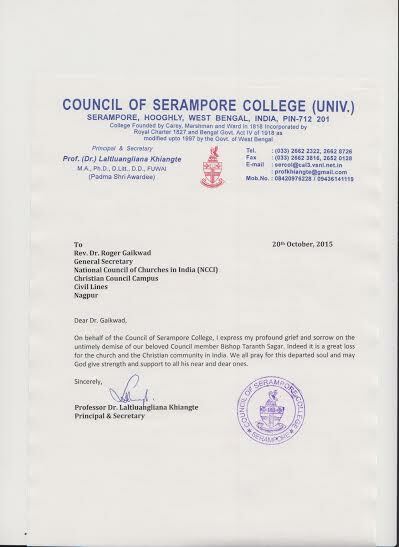 Please find attached a message of condolence from the general secretary, Rev. Dr Olav Fykse Tveit, on behalf of the World Council of Churches. We hope that you will be able to share it as part of Bishop Sagar’s funeral service on tomorrow. If you have any questions or concerns, please do not hesitate to contact us. Greetings in His precious name. I would be grateful to you if you could convey my hearty condolence to the bereaved family of Bishop Taranath Sagar. I have come to know today that Bishop Taranath Sagar, President, NCCI has died of heart attack which shocked me very much. I have no hesitation to say that one of the leading church leaders in India has left us untimely. I had come to know the Rev. Taranath Sagar as the General Secretary of the Methodist Church in India some time in 1990 while I was the General Secetary of the National Council of Churches in India. He was very promt in replying any letter which he had received from NCCI office without fail. He was a man of integrity in his personal life. It appeared that the constituent members of NCCI are proud of his good leadership. His tremendous contributions with the help of the Rev. Dr. Roger Gaiwad, the General Secretary of the National Council in the ongoing ministry of the National Council would not be erased in our minds. May God be with his bereaved family even in the days to come. I am deeply shocked to know about the sudden and sad demise of Bishop Dr. Taranath Sagar. Needless to say that the Global Ecumenical Forum has lost an asset. I was blessed to be a part of the team , that worked under Bishop Sagarâs leadership , during his first tenure as the NCCI President . My deepest condolences to the bereaved family and the Church . May God rest his soul in peace . I am very much shocked to hear the sad news that Bishop Taranath Sagar of the Methodist Church in India has suddenly expired by heart attack. He was one of my friends and as much I know him he was very much open minded and humble church leader. He tried his best to serve sincerely his own Church and Ecumenical bodies in national and International level. It is a great loss for all of us indeed! May be he was too much involved with lot of responsibilities and did not care about his health. I personally and on behalf our Church would like to send condolence to all his dear and near ones for this time of mourning. We pray to Almighty God that he may grant his soul eternal peace and comfort to his family members and friends. 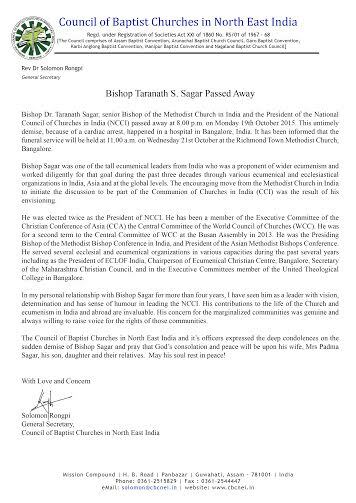 It is very shocking news to receive that Bishop Dr. Taranath S. Sagar, President of NCCI was passed away on Monday 19th October. We are so blessed by his able leadership especially as a President of NCCI. We had wonderful time with him in several occasions. 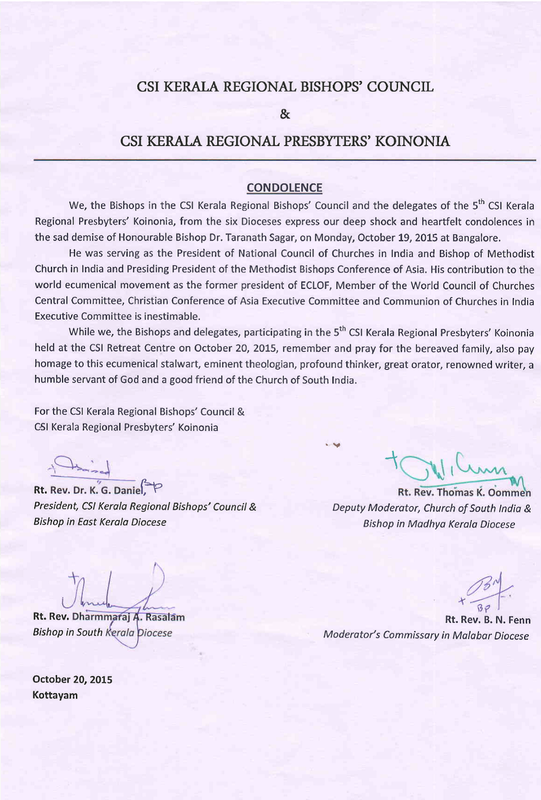 Please pass on our deep condolence to Bishop's bereaved family and Methodist Church in India. On behalf of The Salvation Army India we pay our Tributes to Bishop Dr Taranath Sagar, a Man of God. We are very sorry for the late tributes from our side. At present we are in holidays and when I just opened my office mail box I have noted the below mail and responding immediately. 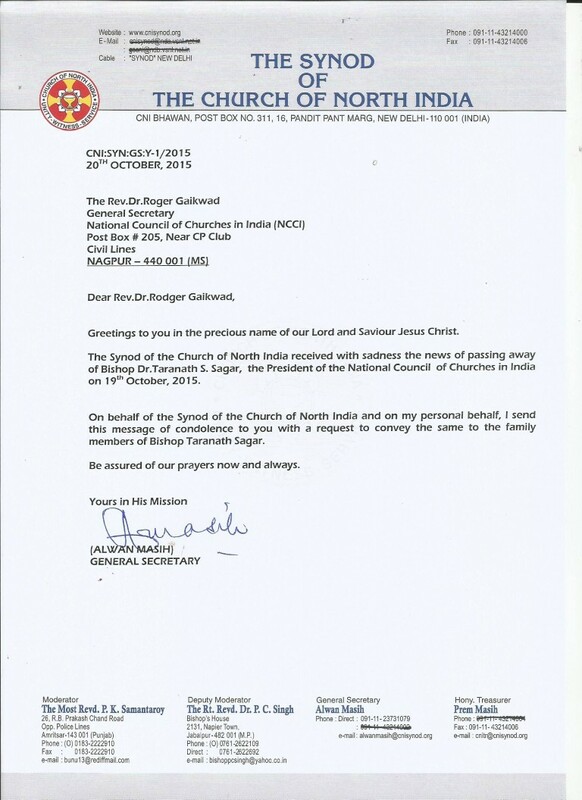 At the same time I have forwarded to all the heads of the Salvation Army in India. 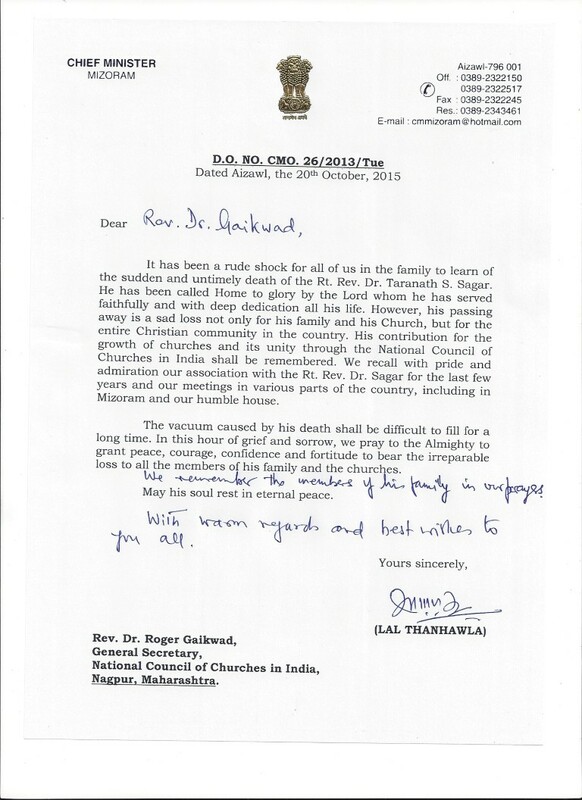 Grace and Peace be with the family of Bishop Taranath Sagar and all the colleagues who closely worked with him. It is with great sorrow that we in CMAI, learned of the death of Rt. Rev. Bishop Taranath Sagar. I write this to express my sincere condolences on his sudden and unexpected passing. 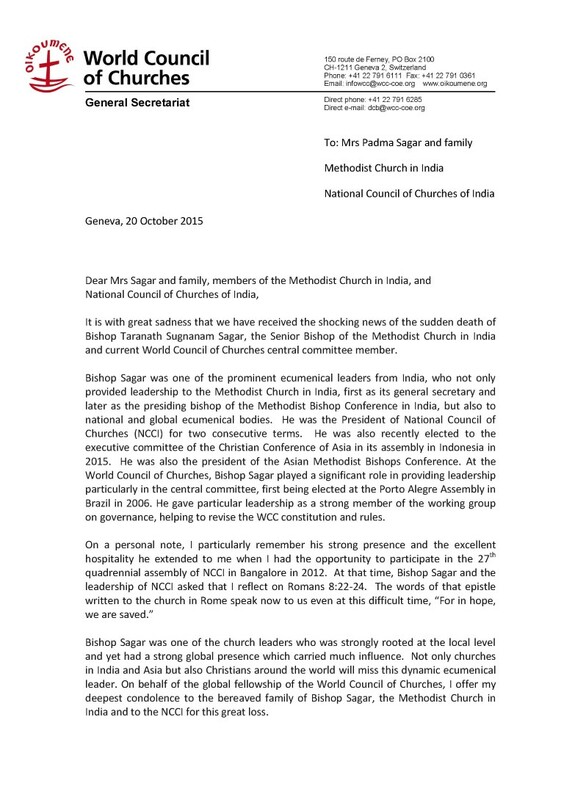 As President of NCCI, he had a strong commitment to the ecumenical movement in India, and I know that you will be missing his dynamic leadership in the family of NCCI. We extend our heartfelt sympathy to his wife and to the entire family who grieve, and we pray that our Lord provides the much needed comfort and His divine peace during this difficult time. dear Members of the National Council of Churches of India (NCCI). With profound sadness we have received the news of the passing away of Bishop Taranath Sunanam Sagar. 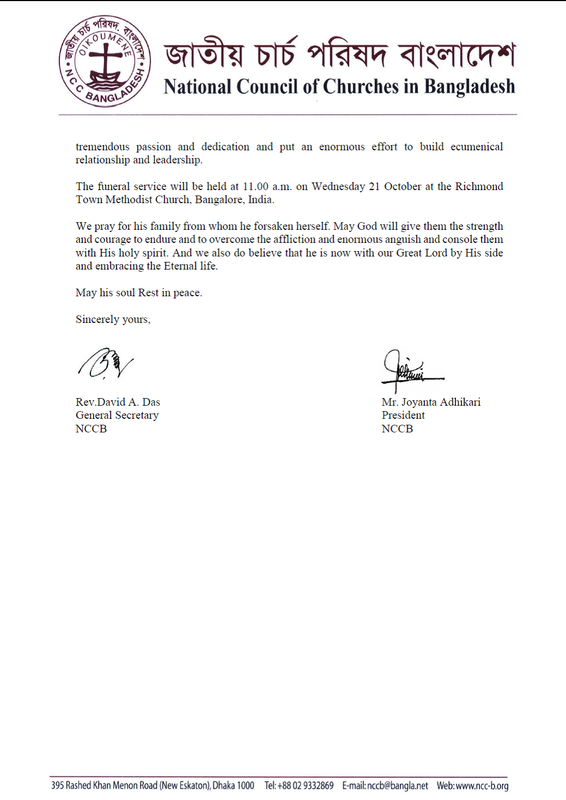 Churches in India and Asia but also Christians around the world will miss his dynamic ecumenical leadership. Bread for the World-EED has always appreciated the development oriented initiatives of the Methodist Church in India in cooperation with CASA and NCCI. Please be assured that we are with you in prayers. May we ask you to convey our deep sympathy to his family.